Beaufort is the second oldest city in South Carolina. It’s a lovely small city, with graceful, historic southern homes in the center, and lush foliage. The film, Forest Gump , was filmed here. For runners, it’s worth the 1/2 hour drive. We’ve put together a 9.5 mile tour, which includes two bridges, a bike trail, and historic streets. Starting at Waterfront Park, head over the Woods Memorial Bridge, with great views of the Harbor River. Coming off the bridge, get onto Meridian Rd. There’s a lovely canopy (but no sidewalk). 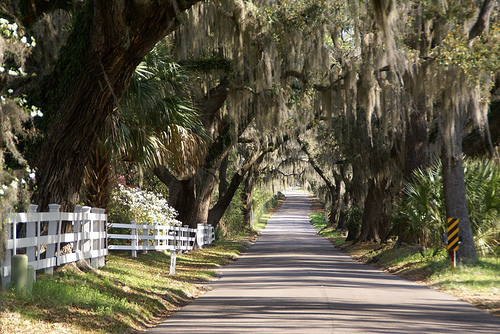 Head west for 1 mile, making your way onto the aptly named Spanish Moss Trail. Continue south (turning right) on the trail for 2.7 miles, until its end near Bay St. Conclude the run with a section along historic Bay St. (also called North St.). Add-On: Enjoy some of the graceful streets in downtown Beaufort, adjacent to Bay St.